Emmanuel Adewole, popularly known as Emmanuel Wonder is a professional footballer(soccer player), lawyer, entrepreneur, philanthropist, and fashion designer. He is a Nigerian who was raised in the United Kingdom (London) but currently resides in Chicago, IL and London UK as he travels back and forth. Emmanuel describes himself as an ambitious, passionate, and caring man. Tell us about your Educational Background. I usually feel humbled when I have to talk about my academics because most people don’t associate such intelligence with footballers, but I continually thank my mother for encouraging me to get an education. I also thank my good friend, Nigerian International John Ogu, who was playing back then in Slovenia, for encouraging me to stay in school before turning professional. I received a double major bachelor in Politics and Business Administration from Drake University in Iowa. I also got my MBA in International Business and Entrepreneurial Management. I later went on to get my LL.B. (equivalent to a Juris Doctorate) from The Nottingham School of Law; followed by an LL.M (Masters of Laws) in Corporate and Sports Law. What were your goals and aspirations as a young boy? How have these matched your current achievements? Honestly, as a young boy I just wanted to make enough money to take care of my mother and brother so she would not have to work so hard. I come from a divorced home so I had no idea what future awaited me. The thought of me playing professional soccer never crossed my mind, however, I remember as an 8 or 9 year old little boy always telling my friends, and family, that I was going to be a celebrity. I guess God heard my request. It is fair to say my aspirations as a child fueled the desire to become who or what I am today. “Believe me, I’m still a kid at heart.” The drive to be successful no matter what I do is certainly the reason for my achievements. It goes without saying too, God deserves all the glory because without him nothing would have been possible. I had to work hard though, extremely hard, to develop the skills needed to play football at the highest level. I was very good at dribbling the ball and was quite fast, but I also had to overcome many failures and obstacles during the course of developing those necessary skill set to be a professional. “Speed and intelligence alone will never suffice in soccer.” One must develop will-power, mental strength, professionalism and hunger for success. There were days when I woke up at 5am to go for runs and questioned why I was even doing it. There were countless hours I was in the gym at Drake University and the instructor will tell me I was working well below my capacity because he knew I could do better. I was told many times by my coaches I have to improve certain parts of my game as a footballer if I was to be a success. I took the criticisms onboard, motivated myself and pushed my limits. As you can tell, the results were rewarding. Who were your role models when you were coming up? My mother. The greatest inspiration I’ve had in my life is my mother because all she ever wanted out of life was to see her kids succeed. In fact, all single mothers across the world are real life super heroes because it is not easy. She prayed for me, motivated me and spent every penny she had to make sure my brother and I never lacked. There were other people that influenced and definitely helped mold my personality. In a way my peers and other footballers that were already playing professionally served as role models of where I wanted to be. Other individuals played significant roles in my life at specific junctions. The list is countless, but Attorney Nathaniel Turner from Indianapolis and his family I owe a great deal of gratitude towards. What sacrifices did you make to become a great soccer player and how has that shaped your life? No sacrifice is bigger than the other when one is chasing a dream, however, I will say always being away from my family and close friends is immense. I have a very close circle of trusted individuals and I hardly get to see them. I am glad technological advancements help ease that burden. I had to spend countless hours in the gym to attain the strength, power and natural physique to compete. In addition to maintaining a very meticulous and strict diet. 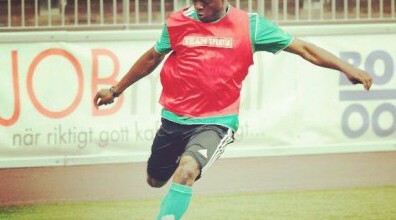 Please share your experience as a soccer player I am quite simply a forward (winger, attacking midfielder, striker). I play to entertain, win, and score goals. I have played in 8 different countries and been involved in over 100 professional matches. I would say playing in the AFC Cup was probably the best international tournament experience I had. I was part of some championship teams during my college soccer days, but the game of football is cruel, and winning medals at the professional ranks have not come by so easily. What lesson have you learned on your journey? Perseverance, self-belief, faith and the importance of a strong family support are paramount to any breakthrough or success I have in life. The Wonder Camps was founded in 2015. It is an international residential summer soccer camp that invited some top professional footballers, coaches and scouts to mentor and train aspiring footballers for a week. The Wonder Camps aims to offer a diverse learning experience to its designated surrounding population in a manner that allows campers to develop confidence, self-esteem, leadership abilities, and problem-solving skills that translate into scholastic ideologies and principles. Please give full details about this new sports blog you founded, Garber sports. GarberSports is a cutting-edge football media platform which allows brands, publishers and fans to create rich, engaging content that is distributed globally across mobile, web and social. Premier sports magazine featuring player profiles, investigative journalism and regular features on professional and college sports, and humorous columns. As a full time attorney and entrepreneur, how do you manage your schedule while yet fulfilling your obligations? It can be challenging; meaning a lot of sleepless nights on various occasions, but it is what I want and it is rewarding. Time management is critical. I have to be committed and disciplined because eventually once all these entities I’ve started grow exponentially I need to be able to still have the intellect and skill to oversea them all. Tell us about your businesses. In addition to playing professional soccer, I own Visao International Group, a growing global consulting firm with intermediaries, legal and business experts in almost every industry from across the world. I co-founded GarberSport, LLC (www.garbersports.com), an online sports websites with the intention of turning it into a featured global magazine covering the lifestyle and hot topics of some of the world’s best athletes. The WonderCamps; which is an international residential summer soccer camp that invited some top professional footballers, coaches and scouts to mentor and train aspiring footballers for a week. For 2016, there a variety of project I am working on such being part of a consortium Sports Management Firm in addition to launching two clothing brands “Sanften Geist” (Bespoke, pocket squares, underwear’s, the EW7 collection, and shoes), and “Ama’n Clothing”, which is a westernized African men’s couture. Dr. Foyekemi Ikyaator opens a full-service Emergency Room in Houston TX. Uzo Aduba on the cover the September Issue of Essence Magazine.